Tecma specializes in shelter services, logistics, joint ventures, site selection, supply chain management, and sub-contract and turnkey manufacturing. With its convenient locations in Texas, Mexico and California, this one-stop company lets manufacturers achieve a competitive edge and greater profits. It also helps them expand flexibility and enables their development and improvement. By creating Tecma’s digital identity, INCORE in collaboration with IWW let the company spread its reach and build long-lasting relationships with clients. We aimed to present Tecma as an innovative leader and information source on manufacturing in Mexico. We wanted people to entrust Tecma and experience its excellent services. A unique logotype is vital in conveying a company’s originality and heritage. Our goal was to illustrate Tecma’s evolution and its modern and dynamic business nature, without creating a brand new design. Tecma's reach continues to grow and strengthen. The company was created in 1985 and initially measured about 8,500 square feet. Now, it’s an internationally recognized enterprise, and its warehouse, production and distribution areas are greater than one million square feet. With more than 4,500 employees, Tecma reaches both sides of the border at El Paso in Texas and Ciudad Juarez, Chihuahua, in Mexico. 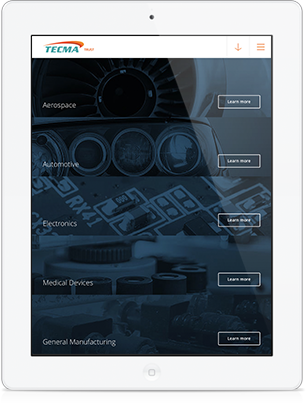 In the era of moving the manufacturing from China to Mexico, Tecma allows this industry to remain in North America. The company’s close proximity to the United States allows it to produce, assemble and deliver customized products faster, cheaper, and more conveniently. Reaching goals is never easy, but it’s achievable thanks to clearly set objectives. When planning Tecma’s digital strategy, INCORE’s main objective was to increase the number of leads generated via the company’s website. To achieve this, we decided to present Tecma as a skilled and trustworthy leader within the industry. 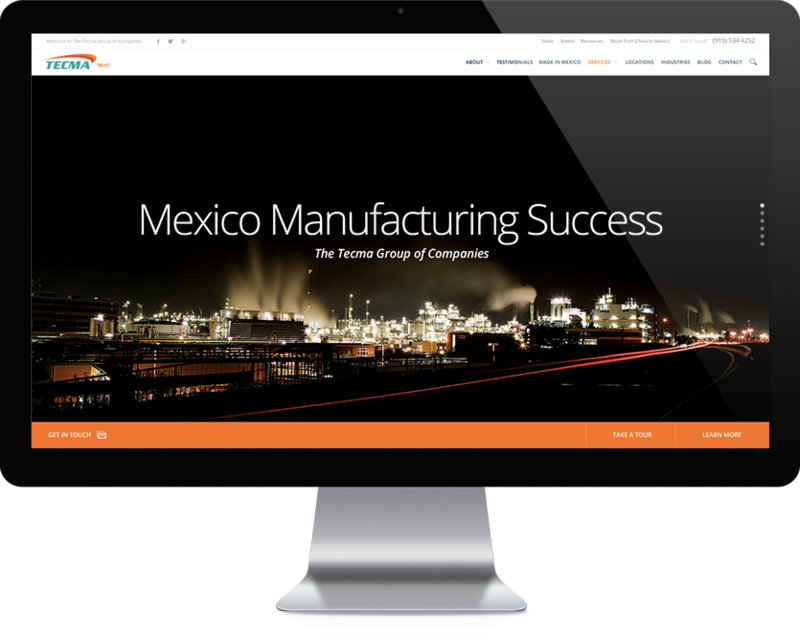 We wanted to promote the company as a reliable source of information on manufacturing in Mexico. Our goal was also to create an image of an innovative and modern corporation, one that’s ready to adjust to the market. 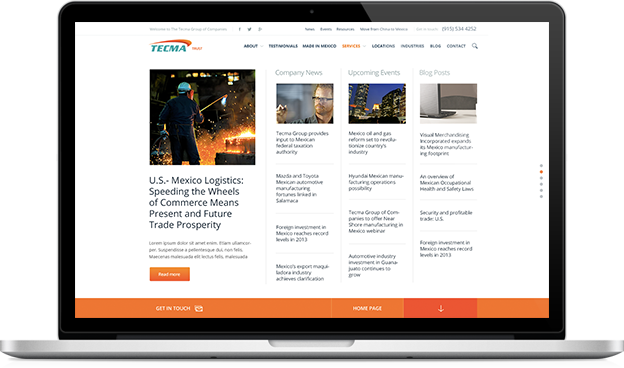 We wanted Tecma to have a strong digital space and to be able to spread its brand’s greatness with timely updates. Lastly, we wanted to establish and strengthen connections between Tecma and its clients. This task poses challenges because the sales cycle takes anywhere between 6 to 18 months, which is a unique aspect of the manufacturing industry. Practical solutions make all the difference in a business’ continuous success. By skillfully executing Tecma’s online marketing strategy, INCORE refreshed the corporation’s branding and its website’s key visuals and functioning. We built the company’s online presence, promoting and strengthening it along the way. This task hadn’t been done before to this extent within the manufacturing industry. In addition, we created effective content, one that conveyed the company’s business integrity, transparency and responsibility. The new website content also highlighted Tecma’s resourceful customer service and innovative solutions and services. We helped the company to illustrate how logical and economical moving manufacturing to Mexico can be for its clients. Moreover, thanks to our online marketing efforts and social media support, we enabled Tecma’s continuous expansion. Very importantly, we allowed the company to establish authentic, long-lasting relationships with its clients, without directly pushing people into buying its products and services. Responsive web design (RWD) crafts websites to deliver a seamless viewing experience across various devices, thus inviting more portable device users. With close monitoring, INCORE detected Tecma’s booming popularity and growing mobile visits. To address this rapid change, we revamped the company’s web design, which improved user engagement and further increased mobile traffic. The architecture and flow of information are fundamental aspects of establishing or designing a useful website. When focusing on Tecma’s web design needs, INCORE approached it by customizing content and creating sections and subsections. This makeover brought a readable and functional website, with conveniently illustrated and conveyed information. Our goal was to ensure a logically and visually structured flow of information and to provide a seamless viewing experience to the website’s users.